Don’t tell my family about this. The Whiting’s have made this recipe for generations and believe you me it’s unlike anything you’ve ever had before unless you’ve been a guest in our house at Christmas. This is not, I repeat, not that junk you buy in a carton at the grocery store. Nor is it an eggnog latte or eggnog ice cream. This is the real deal. 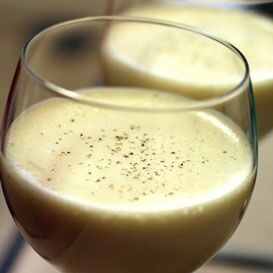 Drink this and you won’t make eggnog jokes ever again. The same thing goes for fruitcake*. Beat the egg whites until they’re stiff in one bowl. Mix the egg yolks, bourbon, sugar, and vanilla together in a large bowl. Fold in the beaten egg whites and whipped cream. Grate fresh nutmeg on top of each cup before serving. Raw eggs, heavy cream, and booze. Told you it wasn’t good for you. * my family’s fruitcake recipe is another holiday tradition passed down through the generations. No, it’s not heavy-as-a-brick and I’ve only had one other non-Whiting fruitcake that came close. One of these days I’ll put that recipe up here too. But not today. Besides, I’ve switched to majoon. instead. A new holiday tradition! Copyright 2019 Jerry Whiting. All rights reserved.